The Topro Troja Walker is a sleek and unique Norwegian designed and manufactured walking frame specifically engineered to assist those who are elderly or limited in their mobility. 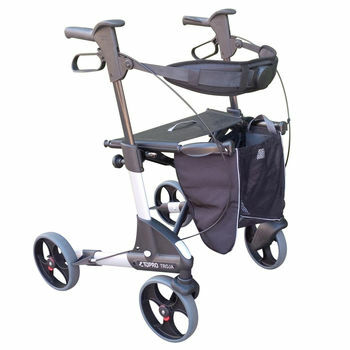 Its lightweight, compact frame and larger wheels make it the walker of choice for both indoor and outdoor use. When propelling the rollator along, the user is provided with a support system enabling them to walk freely whilst maintaining a correct skeletal posture, which in turn, reduces muscles fatigue and strain. For more information about our wheelie walker range, contact our helpful staff today!